Deputies assigned to the Major Accident Investigation Team (M.A.I.T.) investigate a crash that caused serious injuries to a motorcyclist in Clearwater. 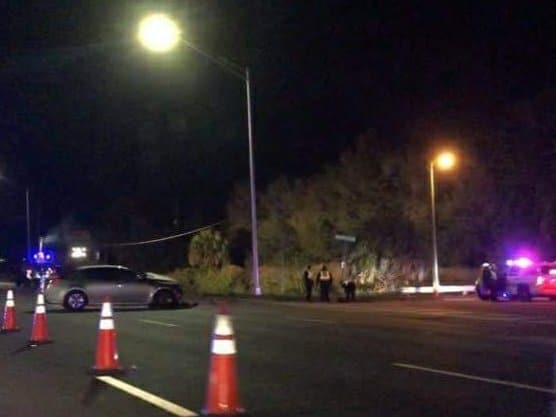 The crash between a motorcycle and vehicle occurred at approximately 8:55 p.m., Wednesday, January 30, 2019 at the intersection of Winding Creek Blvd and US-19. According to investigators, 21-year-old Ryan Decubellis of New Port Richey was driving his 2017 Suzuki Motorcycle northbound on US Highway 19 North. Deputies say that Decubellis was driving with a group of four other motorcycles when he drove past two Pinellas deputies driving fully marked cruisers. Deputies say Decubellis accelerated past the deputies at a high rate of speed. Almost simultaneously, a 2013 Kia Optima driven by 54-year-old Scott Colletti of Clearwater began making a left hand turn across northbound US Highway 19 North traffic, onto Winding Creek Boulevard. Deputies say Decubellis crashed his Suzuki motorcycle into the front of the Kia Optima driven by Colletti. Deputies say that Decubellis was ejected from the motorcycle upon impact with Colletti’s vehicle. Decubellis sustained serious injury as a result of the crash and was transported to Bayfront Health Hospital in St Petersburg. Deputies say Decubellis was wearing a motorcycle helmet. Colletti sustained minor injuries as a result of the crash and was transported to Mease Countryside Hospital. Investigators say the crash occurred before deputies had an opportunity to initiate a traffic stop or activate their emergency equipment. The motorcycle came to rest, submerged, in a ditch along the roadway. Speed is a factor in this case and charges are pending for Decubellis.